A highly concentrated water based pigment dispersion designed as a colorant that is added to ColorPave™ HD 500, ColorPave™ Neutral Concentrate, and ColorPave™ Neutral Ready-Mix. Apply ColorPave™ at a rate of .13 to .15 gallon per square yard (60-70 square feet per gallon) per coat. Two coats are recommended for optimum performance. One pail will cover approximately 240-280 square feet per coat. ColorPave™ Neutral Ready Mix is designed to be mixed with ColorPave™ HD Tint or ColorPlus™. ColorPave™ HD Tint is a highly concentrated water based pigment dispersion designed as a colorant that is added to ColorPave™ HD 250 and 500 Neutral Base. Add one pint of ColorPave HD Tint to one 5-gallon pail (approx. 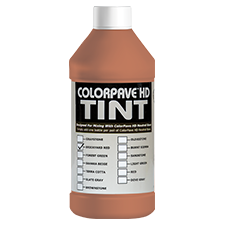 4-gallons) of ColorPave HD 250 or HD 500 Neutral Base. Mix thoroughly until Tint is completely dispersed into the Neutral Base. If needed, a small amount of water may be added to facilitate application. Properly mixed ColorPave products shall be applied by spray, brush, or roller. Be sure to use OSHA approved respirator when applying this product. Temperatures must be above 50°F both during application and for aperiod of at least 24 hours after application. Do not apply when rain is imminent or forecast.